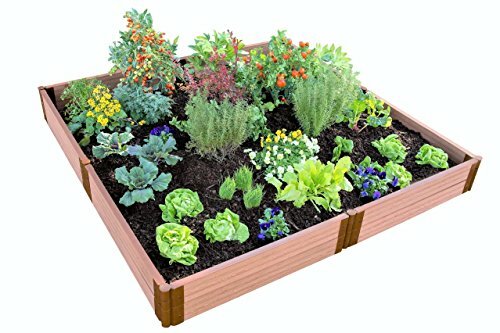 This enormous raised garden bed planter gives you loads space to neatly organize a variety of vegetables, herb, fruits or flowers. 11-inch-high sides give you lots of depth to grow both underground veggies like carrots, as well as tall plants like tomatoes. With 64 square feet of available planting area this may be all the garden you will ever need. Simple to install. Your kit comes with everything you need except the soil and plants. Each modular kit includes sixteen of our 2” Classic Sienna composite boards, and eight each of our 2” anchor and stacking brackets. The insulating open-channel boards trap air, providing insulation to your soil. Keeps soil warmer in the Spring and Fall, and cooler in the Summer, so you can grow for an extended period. Anchor brackets grip the ground tight, so your raised bed will stay put no matter the weather. Serrated stakes prevent keep your raised beds from being disturbed by mowers or any human activity. As your garden needs and expertise grow you can add on to your modular raised bed any time by purchasing additional 2” kits, boards and anchor or stacking brackets to stack or extend your garden. Curved 2” boards are also available to incorporate into your design.